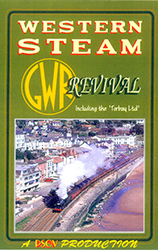 Ten steam locomotives pull excursion trains on eleven routes of England’s old Great Western Railway between 1987 and 1995. This all-action program was filmed in many classic locations and on notable grades. Towns and cities visited include Bristol, Paignton, Shrewsbury, Birmingham, Paddington station in London, Stratford, Oxford, Didcot and more. Filmed by railfan professionals. Published in the UK by PSOV Productions and distributed in the USA by Goodheart Productions.